YourNewBoat.com is now "As Seen on TV"! U-Ship.com. However, the shipper did not have the necessary equipment to move a houseboat. 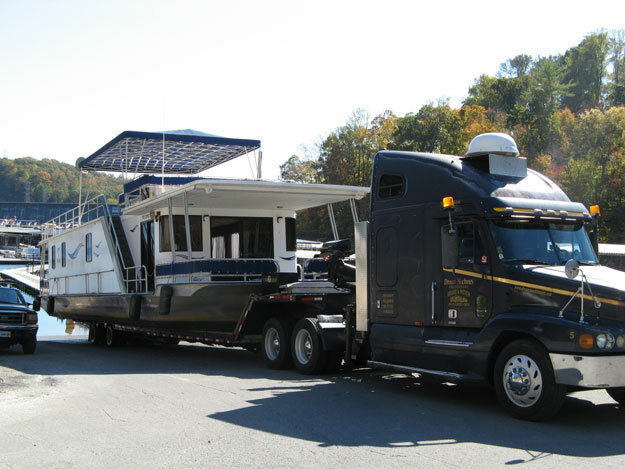 Needless to say, Chris and Robbie were unable to complete the move and the Buyer hired an experienced Houseboat Transporter (like the one pictured below) to complete the task. Once the move was finally completed, the experienced Houseboat Transporter commented that the vessel may have weighed as little as 10,000lbs, and that they could barely feel it on their trailer while they made the haul from Kentucky to Wisconsin. 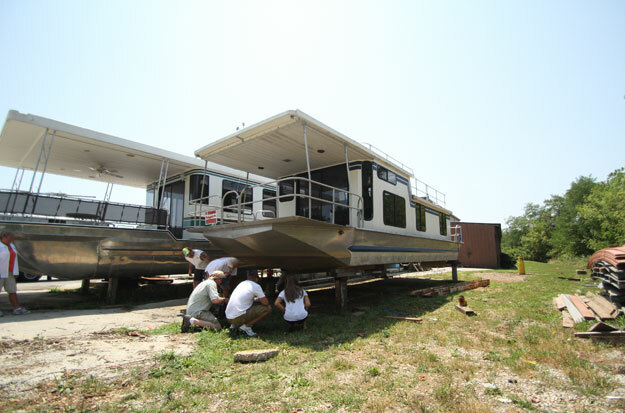 Below is another picture of the 1987 Carolina Kentucky Houseboat and the Shipping Wars crew trying to figure out how to get the vessel onto their flat bed trailer .